The first ever Academy gig, was fittingly, a performance by the reformed Buzzcocks – a memorable night at a well designed and modern student union venue – This has been followed by many subsequent visits – Highpoints including Placebo, Bjork, PIL, Manics etc etc – you name them , they’ve been here. 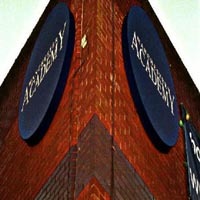 The Academy is the place for signed touring bands, typically successful indie charters and sometimes, big names. A great place to see a band before they get too big to play to an audience smaller than an average premiership football crowd yet . It's small enough to be reasonably intimate, but big enough for creating atmosphere. Curfews mean that there's plenty of after show drinking time back in the City.